I’ve applied the updated rules in today’s update. Did the tweaks help to improve the performance of the two variants in March? Yes. If you want the details scroll on down or click the link titled “The Month So Far” below. By the way, if you’re new or if you’re a regular who missed the news, I introduced some minor tweaks meant mainly to improve the performance of the Trailing Variant, but which also benefited the Fixed TP Variant. 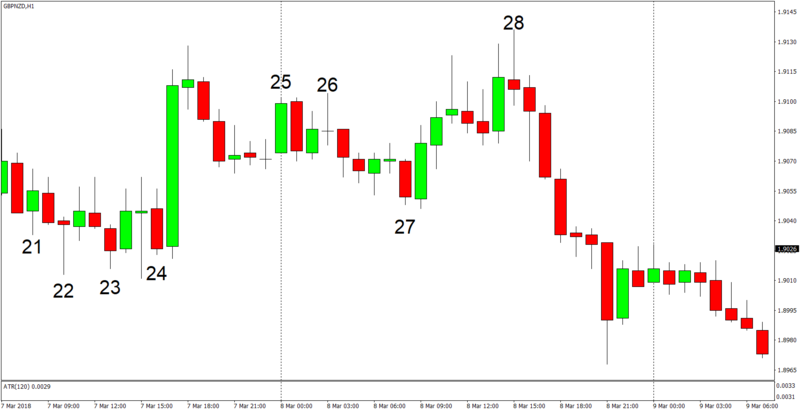 Oh, if you’re a first-time reader and if you’re wondering what the numbers on the charts are about, they refer to the trade #, based on the chronological order when the signal was generated, not necessarily when the trade was opened or closed. I haven’t updated the past daily updates to reflect the new rules, though, but I’ll likely get them done by the start of next week. 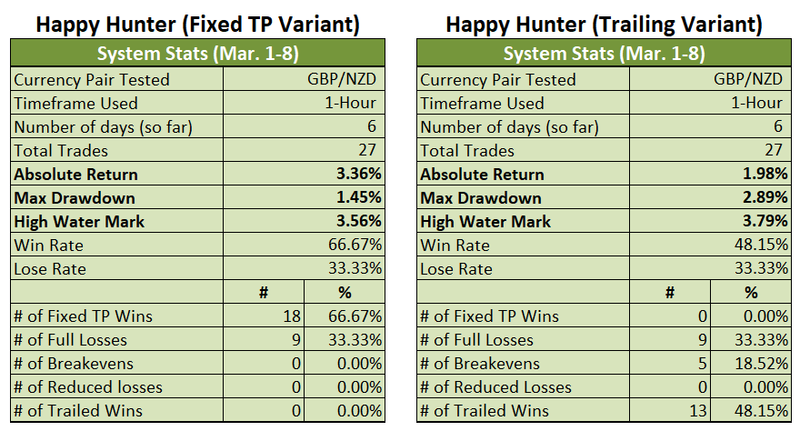 Under the updated rules, the Fixed TP Variant is up by 4.18% for the month after hitting a high water mark of 4.31%. The Trailing Variant, meanwhile, is up by 2.58%, with a high water mark of 3.58%. So did the tweaks help improve the performance of the two variants? Well, just compare the stats above to the stats below, which show the variants’ respective performance under the old rules. 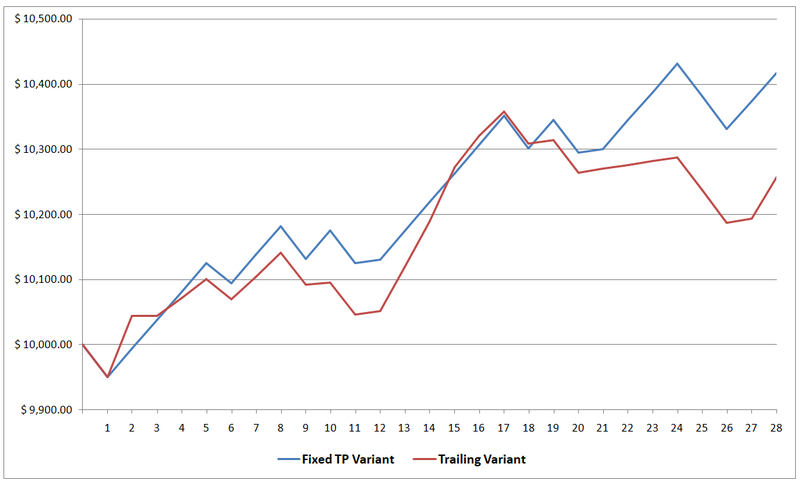 As you can see, the Fixed TP Variant would only by up by 3.36% under the old rules (+4.18% under new rules). 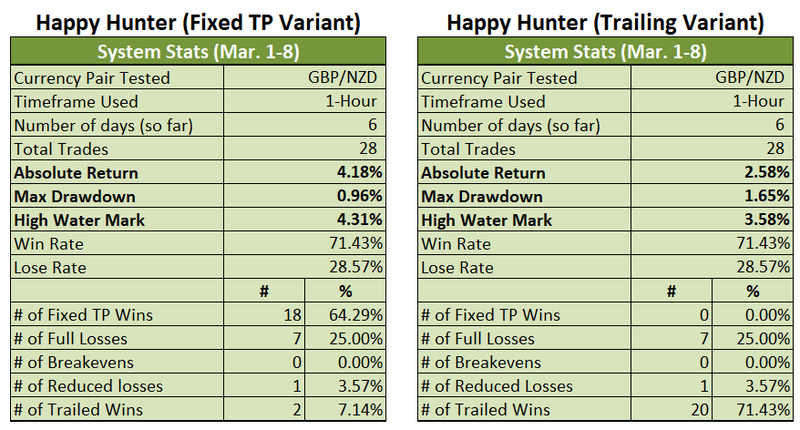 Not only that, the Fixed TP Variant’s drawdown is deeper under the old rules at -1.45% (-0.96% under new rules). As for the Trailing Variant, it would only be up by 1.98% under the old rules (+2.58% under new rules) and its drawdown would also be deeper at -2.89% (-1.65% under new rules). The high water marks of both variants would are also higher. Moreover, the win rate is higher and the lose rate is lower under the new rules. Overall, the tweaks are doing what they’re meant to do, so I’m happy that all that mind-numbing work during the past few weeks did pay off. Anyhow, I’ve got nothing more to add for now. And I still have a lot of suffering to go through in order to apply the new rules on the previous updates, so I’ll just leave it at that. Proper record-keeping and all that, you know. Oh, again, I’ll do my best to have the examples up by next week (I hope). And as always, I enjoy your feedback, so if you have any questions, or if you found a possible error somewhere, or if you just want to say “hi”, then don’t be shy and write a comment down below!